At the time of the Reformation, those Catholics in Wensleydale who refused to give up their faith were served by fugitive priests sheltering in Grove House, which was rebuilt in the mid 19th century by J.A. Hansom and is now known as Thornborough Hall. In October 1835 the church of St. Peter and St. Paul with its presbytery and small school were opened. 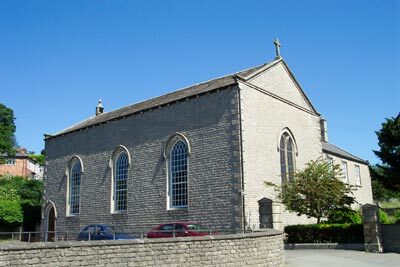 The spacious stone building has large pointed windows and original box pews. The organ, by Pexton of York, was purchased by subscription in 1843. St. Peter and St. Paul works closely with the nearby church of St. Simon and St. Jude at Ulshaw Bridge, and with the parish of St. Mary and St. Joseph at Aiskew near Bedale. All three churches are served by the Priest in Charge from the Leyburn Presbytery. To find St. Peter and St. Paul, leave Leyburn town centre on the Richmond Road, and the church lies on the left opposite the Auction area. St. Peter and St. Paul's is usually open during the daytime. For access when closed please ring 01969 623141. The Old School House (previously our RC Primary School).